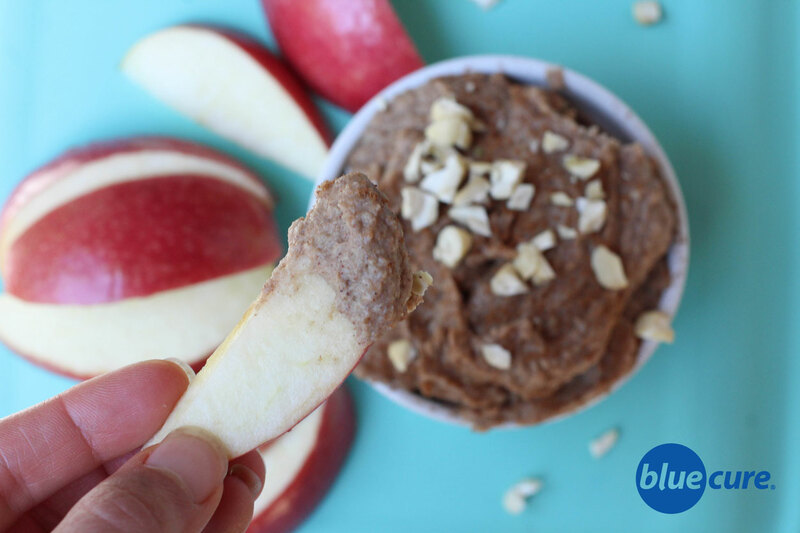 A dessert hummus that is both delicious and nutritious; a great way to include more protein-packed beans in your day! It is naturally sweetened with dates, and uses white beans and cashews to make it creamy. Snickerdoodle hummus is a delicious treat that can be used as a fruit spread or a topping our Blue Cure Waffles and Pancakes. You might even find yourself eating this plain by the spoonfuls! Combine all the ingredients in a high-speed blender. Add 1 Tablespoon of water, if needed. Blend until smooth. The mixture should be thick. Pour the hummus into a bowl and chill in the fridge for 30 minutes to 1 hour. Serve with apple slices or strawberries. Use as a spread on whole grain toast or English muffins. Try it with our pancakes or waffles.